Minister for Sport and Recreation Yvette Berry with members of the ACT Disc Golf Club at the new course at John Knight Memorial Park in Belconnen. Photo: Supplied. The variety of recreational activities in Canberra continues to grow with the northside now having its own course for disc golf, a game very similar to traditional golf, except instead of hitting a ball with a club into a cup, you throw a plastic disc into a metal basket. 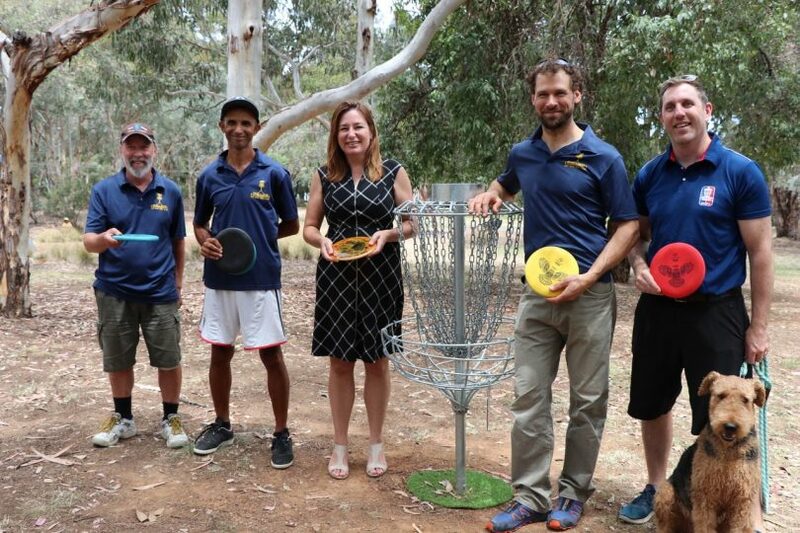 ACT Minister for Sport and Recreation Yvette Berry launched the ACT Disc Golf Club’s new course at John Knight Memorial Park in Belconnen on Tuesday, teeing off with club members. A Government grant assisted the club to construct the new course, set mostly among woodland and some mowed parkland. “This great new course on the northside complements the existing disc golf course at Eddison Park in Woden to bring this easy, fun game to even more Canberrans,” she said. Ms Berry said Canberra was Australia’s most active community and had a huge variety of ways to participate in active recreation and play. “Many people have already been trying out this new course over the break, and I’d encourage everyone to have a go at this free, fun, family-friendly activity,” she said. She said disc golf did not need to be played in a structured or competitive way and was an excellent way to enjoy getting outside, get active and healthy. ACT Disc Golf Club President Todd Nowack said the John Knight Park course was a welcome boost for the club and would attract new players to the sport. He said the nine-basket, dual-tee course was created to be beginner-friendly while also allowing more experienced players to challenge themselves. “I’m also looking forward to being able to attract major events and elite players to Canberra to enjoy this new course,” Mr Nowack said. The club’s website says the new course is par 56 with dual tees and dual pin positions making for 36 unique holes to play. “It is fully signed with a main sign board, practice basket, tee signs, concrete pads, and next tee signs for a couple of holes. The course is beginner friendly with the front 9 ranging between 45 and 65m for the Par 3s with the back 9 playing longer and more difficult. The course is mostly wooded, set amongst native gum trees with a couple of holes shooting over mowed parkland,” it says. The course is open anytime and is free to play. Park in the main parking lot off Townsend Place and it is a short walk down the first path entry to the first tee. Gate closes after dark. Last year the ACT hosted the Australian Championships at the temporary 27-basket course at picturesque Weston Park. Have you played disc golf before? What are your thoughts on the new course? Let us know by commenting below.